At Xtreme Garage™ we did not invent the garage door opener, we perfected it. Simple, reliable design; heavy-duty, high-quality components; and easy installation are what make Xtreme Garage™ garage door openers great. A garage door opener is something you depend on every day. For this reason, Xtreme Garage™ garage door openers have been engineered to operate in all temperatures, from hot summers to extreme winter conditions. 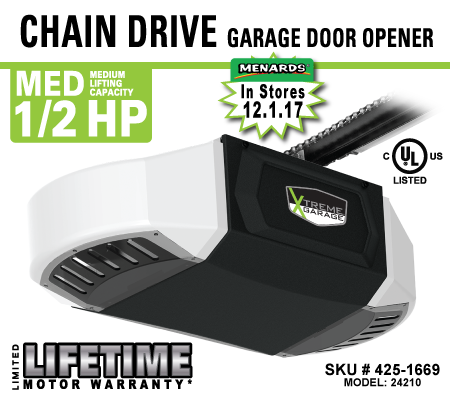 The 1/2-horsepower electric chain drive garage door opener is a great two light opener offered by Xtreme Garage™. This opener is designed to handle most sectional garage doors up to seven feet tall and 18 feet wide. Auto reverse safety system - Garage door will stop and reverse automattically if optical safety sensor beams are obstructed or pressure is detected.